Home / FAQs / Renewal / How do I renew my SSL Certificate? 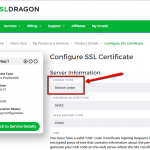 Click on the “Renew” button on the product page of your expiring SSL Certificate within your SSL Dragon account. Complete the payment of the newly created invoice for the renewed SSL Certificate. Once the invoice for the renewed SSL Certificate is paid, click on “Back to Client Area” or go to “My Services” section inside your SSL Dragon account. Click on the renewed SSL Certificate. Once you are on the SSL Certificate’s details page, scroll down and click on the green button that says “Configure Now”. Under the “Order Type” you should choose “Renewal”. This information will go to the Certificate Authority, and they will know that you had an SSL Certificate and you are renewing it. In this way, your new SSL Certificate will be connected to the old one. All remaining days from the previous SSL Certificate will be added to the new one. After that, you have to submit a CSR. You can use the old CSR from your previous SSL Certificate, or generate a new CSR. Either way is fine. Fill in the rest of the form information for your renewed SSL Certificate. Then pass the domain validation, or business validation, or extended validation, depending on what applies to your SSL Certificate. When your SSL Certificate is renewed, you need to reinstall the new SSL Certificate on your server. With other words, you need to replace your old / expiring SSL Certificate with the new one which you have just received. The old certificate will NOT get replaced, renewed or continued automatically. If you have a CPAC or Code Signing Certificate from Comodo/Sectigo, Thawte or Symantec, then steps 4-5 do not apply to you. You will have to fill in the certificate request form for your CPAC/Code Signing Certificate on the certificate authority’s website further. If you are renewing a Business Validation SSL Certificate or an Extended Validation SSL Certificate, you will still have to pass the Business Validation or the Extended Validation again. Anyway, the Business Validation and Extended Validation processes are quicker when renewing an SSL Certificate than when getting it for the first time. If you own a Multi-Domain (SAN/UCC) SSL Certificate for which you have previously purchased & added additional SANs (domains), you need to include them when buying the new SSL Certificate. Please open a ticket with us for more details.